Yum! Get ready to try out these delicious homemade treats this Diwali. If you are planning on doing some last minute planning for your Diwali (Deepavali) parcels, then it's not too late to try out these recipes. First up on the list is a yummy burfee cake that is sure to have your family and friends talking until next year's celebrations. Then we have coconut ice with a twist that's bound to leave your mother-in-law begging for the recipe. 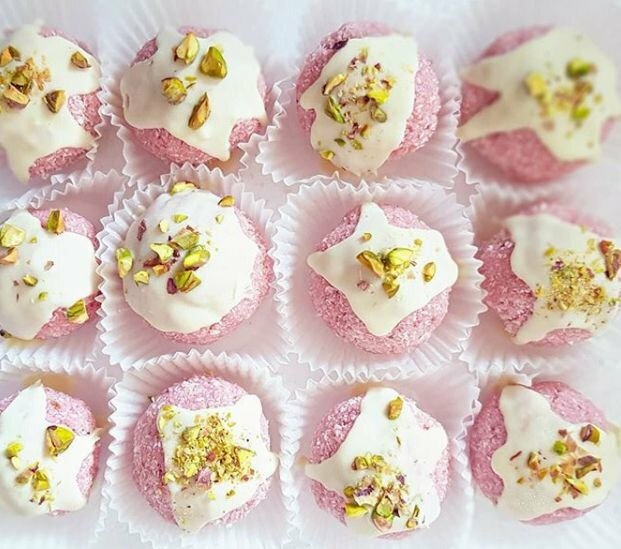 Did we mention there's also a recipe for Gulab Jamun stuffed with pistachios? Keep reading to find out how you can make these Diwali treats. "A delicious fusion dessert combining two of my favourite desserts, burfee which is an Indian fudge and cake infused with cardamom and vanilla. Absolutely heavenly," says food blogger Landi Govender about this delicious burfee cake. 2. Whisk softened butter and sugar until light and creamy, add in 1 egg at a time and whisk until just combined. 3. Sift all dry ingredients and add it slowly into the wet ingredients whilst whisking. 4. Add milk, vanilla extract and salt and mix until just combined. 5. Pour batter into prepared pan and bake for 30 minutes. 1. Using an electric mixer, cream butter, add in sifted icing sugar and klim powder. 2. Add in a little bit of milk to get it to the consistency you want. 3. Add in cardamom and vanilla. Mix until just combined. 4. Icing should be light and fluffy. 5. Wait for cake to cool completely before icing. Coconut ice is another favourite for Diwali and you definitely want to try these raspberry, pomegranate and white chocolate blocks of goodness. "This delicious sweet treat takes minutes to whip up and an hour to set, it doesn’t get easier than that. This year I decided to make something a bit different, adding actual flavour to the mixture and leaving out the food colouring. What better than raspberries and pomegranate preserves and some white chocolate to take this humble treat to the next level," says Landi. Here is how she made this delicious new take on the classic coconut ice. 1. Combine all the dry ingredients into a bowl. 2. Stir in the condensed milk and both the jams until combined. 3. Pour mixture into a shallow dish, I used a silicone baking tray and refrigerate till set. 4. You can cut the coconut ice into squares or into shapes using cookie cutters. 5. Break chocolate into a bowl with a teaspoon of coconut oil and melt in the microwave at 20-second intervals, stirring between until melted. Wait for chocolate to cool down and dip your coconut ice into them and allow to set on baking or wax paper. Food blogger Kirosha Kamal used a tried and tested recipe that her mom has been using for decades to make this delicious Gulab Jamun. This recipe is from the popular Indian Delights cookbook, but Kirosha added her own touch. "The only variation I made was to replace ghee with butter and I took this sweet delight a step further by splitting the middle (when cool), stuffing some pistachio nuts in the middle and sprinkling with coconut. You can keep this sweetmeat in an airtight container for days, even weeks, but the chances of it lasting that long is highly unlikely," she says. Follow Kirosha's Kitchen for more ideas.